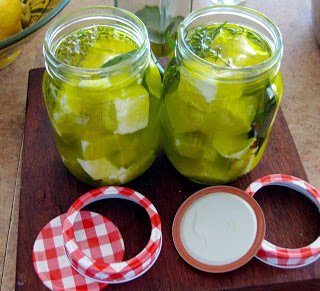 Feta Cheese: Making Your Own! With a good source of fresh milk I have recently been venturing into the wonderful world of home cheese making – something I have always wanted to do but thought it would really be too complicated to try at home – not so. This is apart from the fact that I adore cheese and one of the joys of traveling is getting to try new varieties. People talk about the romance of the vine and wine making, but I think there’s a lot in the romance of the ‘rind’ – cheese-making – the sources of milk from a wide variety of landscapes, the family traditions, recipes and love that goes into the making of cheese. 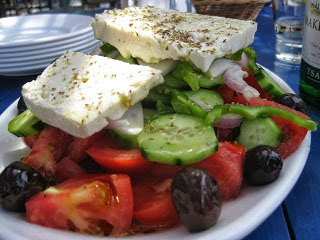 Where would a good Greek salad be without a big slab of feta cheese on top of a glistening bowl of tomatoes, cucumbers and olives, drizzled with local olive oil and sprinkled with herbs? This all started with making my own yoghurt, and from that labneh and ricotta. 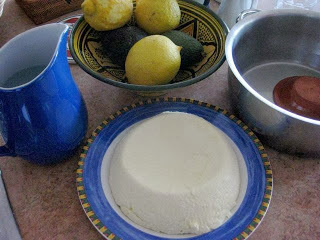 So when I saw this recipe for home-made feta by Matthew Evans, that included raw yoghurt, my eyes lit up. It does take a while, but you don’t have to watch it all the time – it’s really about the alchemy of beneficial bacteria (as in yoghurt making) which do take a bit of time to work but, believe me, the end result is worth it. WHAT YOU WILL NEED: A thermometer – just a simple one with a prong that clips onto the edge of the saucepan. 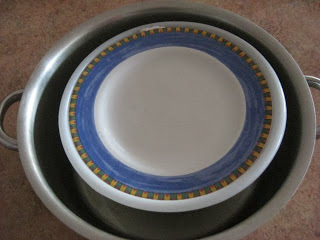 Sterile implements and bowls – this is where a dishwasher comes into its own – everything gets washed thoroughly and then heated while they are drying. Clean piece of muslin (cheesecloth) or use a brand-new Chux. NOTE: Matthew Evans states that he had varying success using junket tablets, but I found they worked just fine – as you can see!. The only way I could lay my hands on rennet was by ordering it on line and I just couldn’t wait however, junket – being an old fashioned milk coagulating desserty thing, is readily available in my country town mini-supermarket. I remember in my Domestic Science classes at school having to make junket as part of an ‘invalid meal’ – like yoghurt, it’s easy to digest. 1. Heat the milk in a large saucepan over a low flame until it reaches 32C. 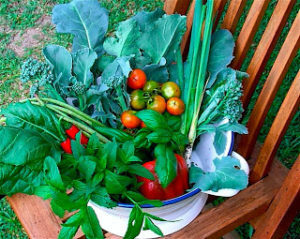 You need to keep it as close to this temperature for about an hour so put straight away into an Esky or insulated bag. Put a wad of newspaper on the bottom because it the pan will be hot, then zip it up. 2. After one hour, add the yoghurt and whisk it through the milk. Put the lid on your pot again and zip it up for another hour. 3. Whisk the rennet or junket mixture to the milk and then stop the milk from moving with a large spoon (you need the milk mix to be completely still while the rennet is working). Cover again and leave for 8-12 hours, or overnight. Do not disturb during this time. 4. 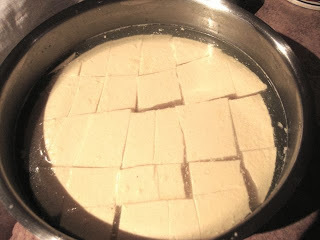 Once the curds are set, use a long knife to cut the curds into squares and leave to sit for ten minutes. 5. 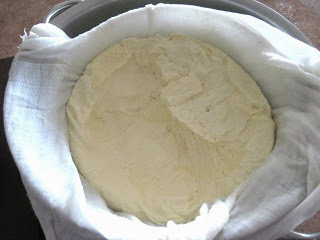 Line a colander with a layer of muslin leaving enough to cover the top of the cheese, drain the curds through it and wrap the cheesecloth over the top. 6. Put a plate on top that will cover most of the cheese and top with about 1kg of weight – I used a couple of cans of tomatoes. 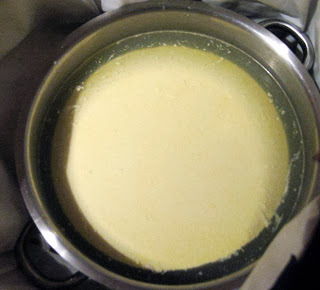 Stand back in the saucepan on top of an inverted little dish so that your cheese is sitting up above the strained whey. Refrigerate and leave for 24 hours. 7. To make the brine solution, mix together the salt with 1 litre of water and stir to dissolve. Cut the cheese into squares, place in sterilized jars, top up with the brine and leave for a day or two before using. Will keep for a couple of weeks in the fridge. NOTE: Brining the cheese ‘hardens’ it up and gives it that distinctive feta characteristics. If you want a softer, milder cheese, strain from the brine after a couple of hours and keep by covering in olive oil. You can also add some lemon peel/garlic/herbs/chillies etc. 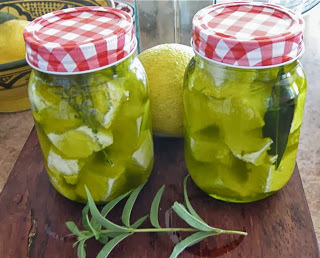 – I just love marinated feta for breakfast and lunch and then add to salads for dinner. Ideally, I would have marinated this in a lighter olive oil, but the extra virgin was all I had – it just gives a stronger taste. This cheese left unbrined is very similar to Greek manouri cheese. 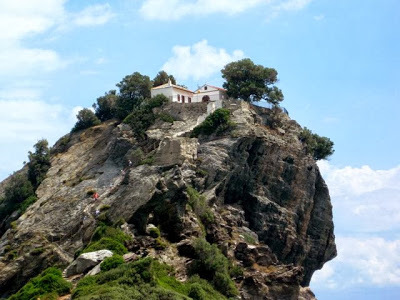 I had a delcious salad of this on the island of Skopelos (where they made the film Mumma Mia). The cheese was grilled until lightly golden and then placed on a bed of wild rocket and cherry tomatoes with a dressing of reduced balsamic. At home in Mullumbimby, all I had to do was put on ‘Dancing Queen’, eat some of this yummy cheese and I was right back there. NOTE: This is a very economical cheese to make at home. 3 litres of milk made 800g of feta.